Ex Cathedra and Jeffrey Skidmore unearth more fascinating treasures with this latest anthology of Latin American music from the seventeenth and eighteenth centuries. The first volume—‘New World Symphonies’, released in 2003 on compact disc CDA67380—has been hugely popular, getting regular airplay on Classic FM. 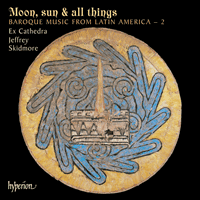 The works on this disc were chosen from the vast amount of extraordinary repertoire Jeffrey Skidmore discovered on research visits to the USA, Mexico and Bolivia. Hanacpachap cussicuinin is a piece still widely performed throughout Latin America, its steady, processional drumming creating a haunting and seductive atmosphere. It is set for four voices in Sapphic verse in the Quechua language. The colourful imagery of the sequence of prayers skilfully mixes Inca and Christian imagery, with its references to stores of silver and gold, life without end, deceitful jaguars and sins of the devil.